Replace. This inserts the contents of what you enter in the 'With Value' box into all the Records being acted on. Delete All. This clears the value of this Field in all the Records being acted on. Append. 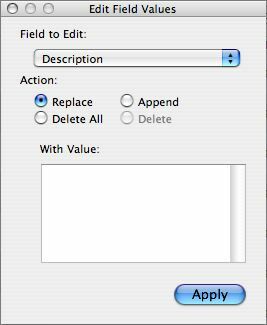 If selected, the text in the 'With Value' box is appended to the end of the existing text. Delete. 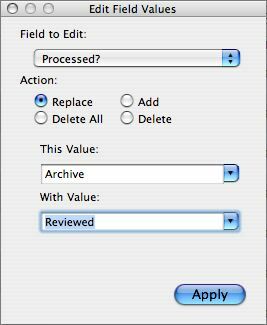 This deletes the contents of what you enter in the 'This Value' box from the existing values in this Field in all the Records being acted on. Add. This adds the contents of what you enter in the 'With Value' box to the existing values in this Field in all the Records being acted on. Replace. You now use both text boxes to specify both the replaced and new values for a Replace. 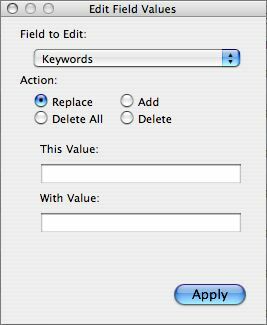 Here, with this multivalue Field we see the same dialog as for Keywords above but notice the two text boxes have drop-down lists. These drop-downs display the pre-defined list for the Field. 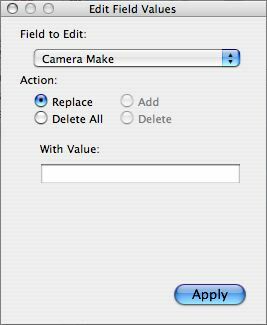 There is no 'Cancel' or 'Close' button on this dialog but it can be cancelled by clicking the small 'x' button at the top left (Mac) or top right (Windows) corner of the dialog.